Forget 'The Bronx Is Burning.' These Days, The Bronx Is Gentrifying In the 1970s, the phrase "the Bronx is burning" became a shorthand for urban decay. Now, money is flowing in, but not without controversy. 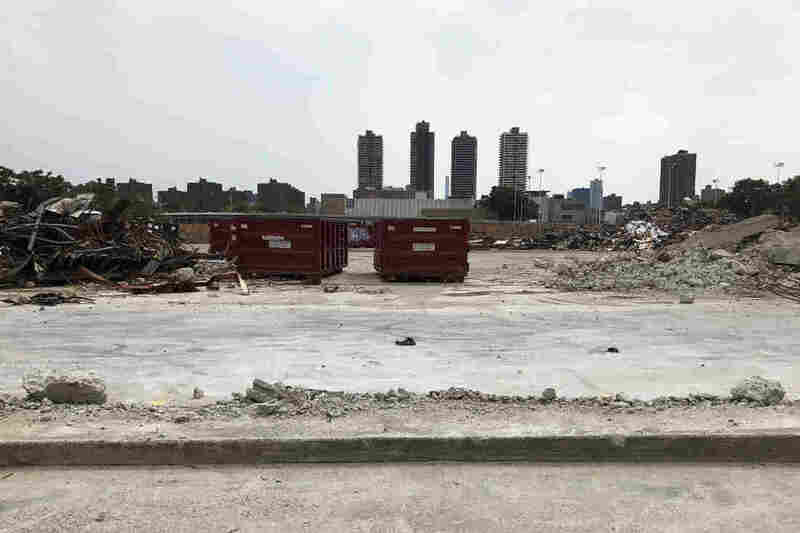 The site where developer Keith Rubenstein and partners plan to build a luxury residential complex on the waterfront in Mott Haven, one of the poorest communities in New York City. The South Bronx in New York City has long struggled to shake one image in particular. It was the 1977 World Series at Yankee Stadium, and ABC sportscaster Keith Jackson interrupted his commentary to describe an abandoned building that was engulfed in flames. The phrase "the Bronx is burning" became a shorthand for urban decay. But these days, the Bronx is gentrifying — bringing its own kind of unrest. Mott Haven sits at the southern tip of the borough, right across the Harlem River and just one subway stop from Manhattan. It's surrounded by a tangle of highways, and has some of the highest asthma, poverty and crime rates in the city. Along the industrial waterfront, there's a constant roar of garbage trucks headed to a nearby trash transfer station. The area handles nearly a third of the city's garbage, and local activists say, for generations, officials used the neighborhood as a dumping ground. But as rents rise across the city, people who've been priced out elsewhere are moving here, and after years of disinvestment, money is flowing in. Within a few blocks of the waterfront, there's a new gourmet pizza place, a new boxing gym, and a new coffee shop. And they all have something — actually, someone — in common. Developer Keith Rubenstein co-owns these businesses. 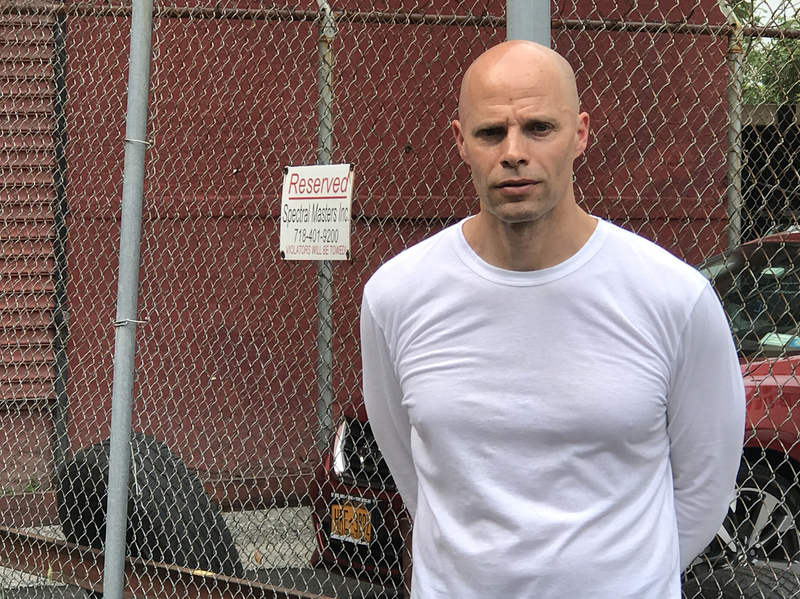 He's building seven new residential towers on the waterfront: about 1,400 luxury apartments with panoramic views of Manhattan, plus swimming pools, gyms, a dog spa, music studio, an art studio, and a new waterfront park open to the public. A city plan called for revitalizing the area through private investment, and Rubenstein said that's exactly what he's doing. When it's complete, he said the new complex will be a "great place for people to live, and a great place for people to come and use the retail and waterfront esplanade." But Rubenstein admits some of his marketing efforts have backfired. First he tried to brand his development the Piano District — after old piano factories that used to be here. Residents accused him of trying to invent a new neighborhood. Later, as a promotion, he hosted a star-studded party, with a "Bronx is burning theme," with flaming trash cans and a car with bullet holes as decor. Up the street, John Matos, known as Crash, said he found the party offensive. "I lived through the buildings being burned down," he said. "I've been through the neighborhood being shot up. No one really wanted to be reminded of that." Developer Keith Rubenstein is building seven new residential towers on the waterfront in Mott Haven. Crash became famous for graffiti, tagging subway cars that traveled all over the city. From what some call vandalism, he's gone into legitimate business. He runs a gallery called Wallworks with his daughter that showcases Bronx artists. He said he has mixed feelings about the changes coming to the neighborhood. "It will help revitalize the neighborhood," he said. "The bad part of it is many people who can't afford the rents that come with this change will have to move out. They should celebrate all these restaurants. And they're the ones that will feel change the worst." According to the real estate website Streeteasy, rents in the neighborhood spiked 16 percent just last year. Crash said he's worried he might get priced out of his gallery. And even some people who could cash in on the hot real estate market are anxious. Down the block, there's a small storefront church called Fordham Gospel Mission. Pastor Tinnie James owns the building, lives upstairs, and said she's constantly fielding calls from potential buyers promising $1 to $2 million. "Every day, every night, all through the night, they're calling," she said. But she's turning them all down. "I'm not looking for money," she said. "I'm 80 years old. What's money going to do for me?" She said she's praying that families can stick together as rents rise. Other activists are trying to buy some of the land, to keep it open to the public. Meanwhile, Rubenstein said he's listened to residents, he's apologized to anyone offended by the Piano District branding and the party, and he's trying to do right by the community. People who live in the public housing down the street work at the new pizza place. The boxing gym will offer scholarships to local kids. And residents who've been clamoring for access to the waterfront will finally get it. "I see my role as being a developer, and a developer that can act responsibly at the same time by helping to support locals in the community," he said. "If anyone's benefiting from all of this stuff, it's the people who are here." The question for many people here is, when the new Bronx is built, whether they will be part of it. For more about New York City's changing neighborhood, visit The Affordability Project at WNYC.org.